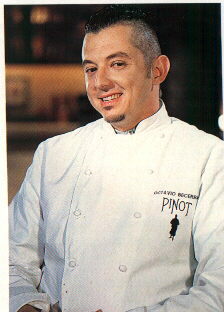 partner of Pinot Bistro in Los Angeles, of studying to be a chef. Beard Foundation for his cooking at Pinot Bistro. he left to study in France and Spain. Warm Crab & Fingerling Potato Salad w/Horseradish, Creme F.
Recipe By     : Octavio Becerra -- Pinot Bistro, LA, Calif.
allow to cool slightly, then slice. Pick crab meat clean to make sure no shells remain. Set aside. thoroughly, then gently add cleaned crab meat. the herbs and lettuce, making sure they are crisp and clean. leaves around the dish. Garnish with onion sprouts and garlic blossoms.